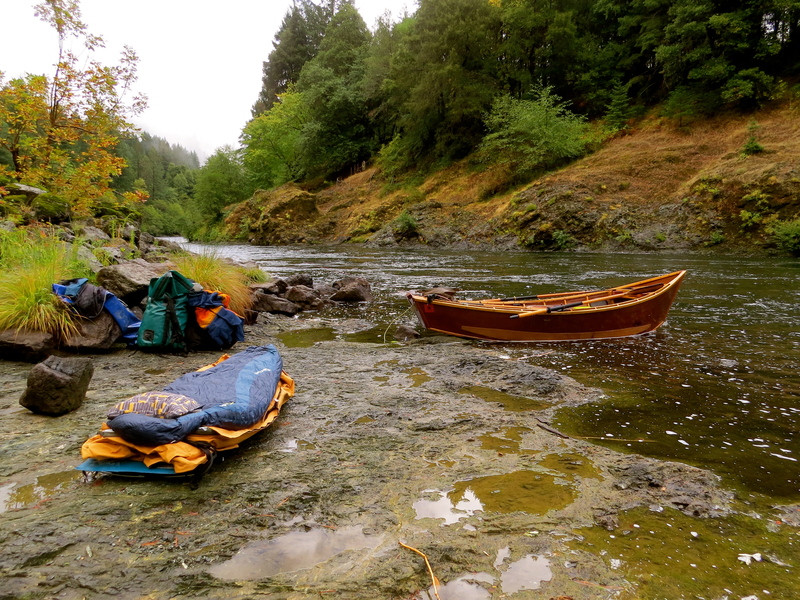 The forecast for our October trip on the wild and scenic section of the Rogue River this year was rain…. lots of it. We could see it coming a week away and there was no way to stop it. The tributaries were all running strong. It was quite a contrast to last year when we launched on a record low level of water and had a hard time getting our boats “lined” around the Class VI Rainie Falls. 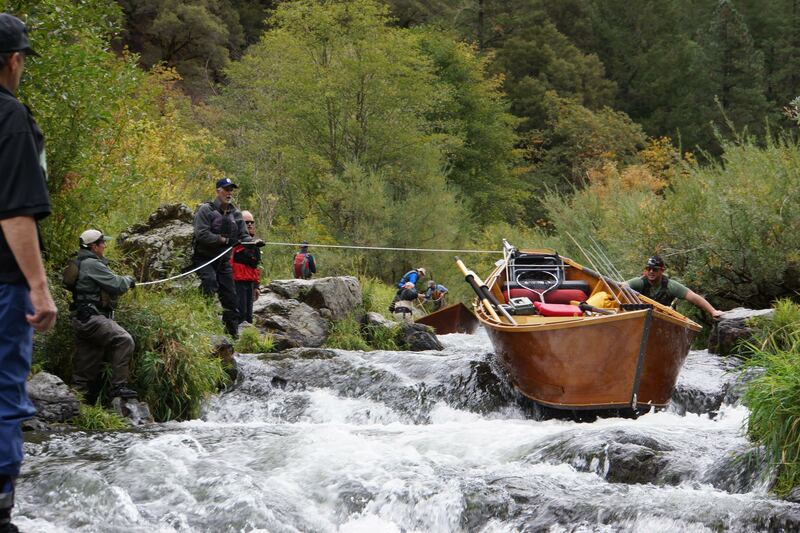 This year, on a higher water level, the lining channel was treacherous for other reasons…. higher water, slippery rocks, and runaway boats kept us on our toes. Lining our boats around Rainie Falls. A few days before our launch date, while other groups were making decisions about whether or not to go at all, we were making decisions about what gear to pack. Our most seasoned river rat, Scott Vollstedt (Commander “Fun-sucker”), has a saying that goes something like this….. “there is no such thing as bad weather – just bad gear and poor planning”. We packed our best water-proof gear and planned to get nailed by one of the biggest weather systems of the season. 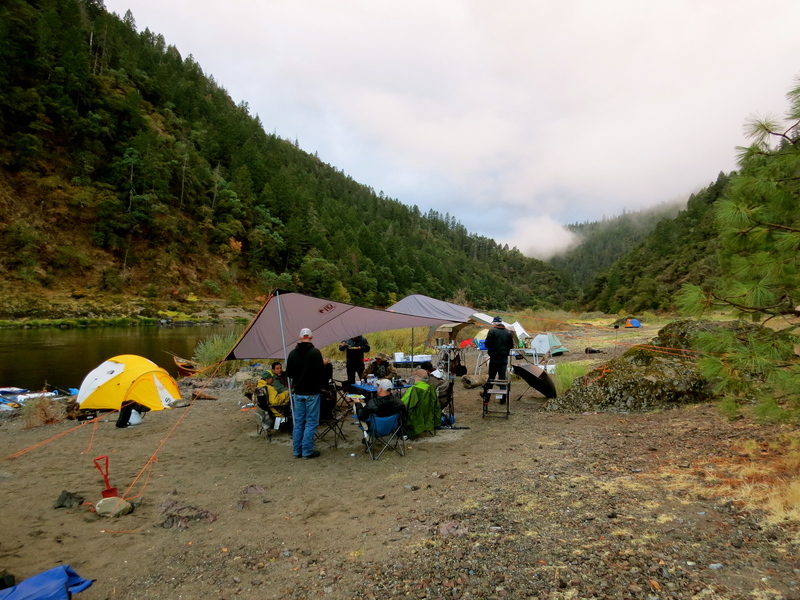 With rain flys and triangle tarps we had a covered kitchen and enough room for a mini mess-hall where we huddled and ate, smoked cigars and sampled various Oregon whiskey’s around a propane fire before “lights out”. The weather was even more aggressive than expected and we estimated that out of 4 days and nights on the river, it rained 65% to 70% of the time. That’s A LOT of water in October… even for Oregon. River Rat council on the Rogue. Our drift boats became rain gauges for the nightly deluge and each morning we bailed them out before loading them up with gear and fishing our way downriver. As usual, we ate well. Each cook team did their best to “outdo” the other and featured such favorites as “Huli Huli” Hawaiian Chicken, Pasta and rice, fresh “Guacamole” and chips, and steelhead appetizers. 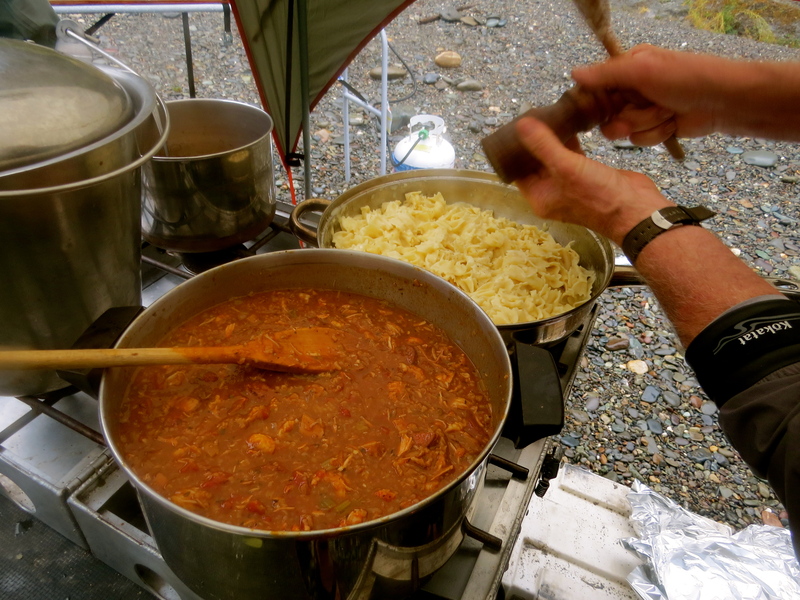 The blue ribbon of “river cuisine”, however, went to the Sunday night crew who prepared an Oregon Jambalaya which included fresh crawfish from Lake Billy Chinook in central Oregon (peeled and prepared by Jeremy) and blackened salmon from the Umpqua River in southern Oregon (caught and prepared by Jayson). 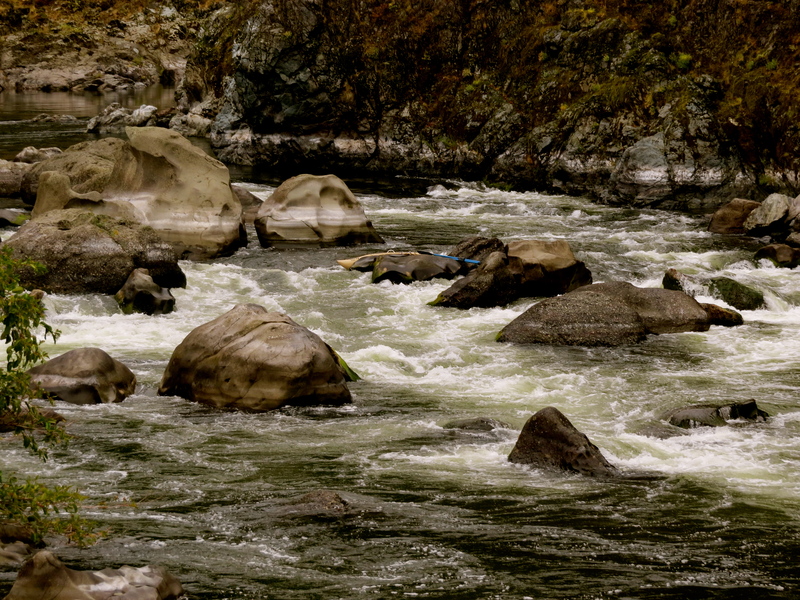 With such rainy weather we pretty much had the river to ourselves….. or did we?? On the morning of the third day I left camp early to fish a slot just below the riffle at Missouri Bar where we had camped for the night. Just a couple hundred yards from our camp, a black bear was making his way upriver toward camp. I grabbed the camera and started shooting. The bear stood on a mossy rock with a commanding view of the river as well as my boat and I slowly rowed to the rock for a closer shot. 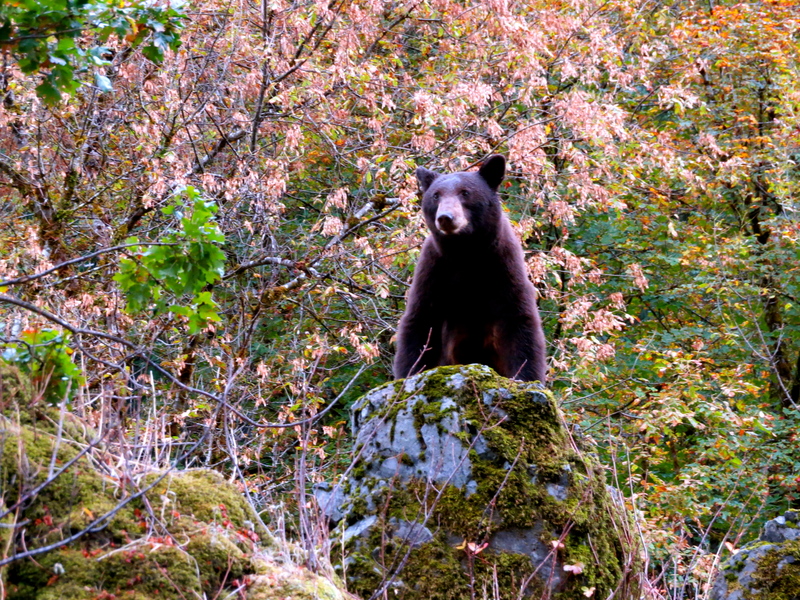 It felt like I was craning my neck up at him from directly below but, figuring the bear would not jump off the rock and into my boat, I was pretty safe – although still pretty close. It was a cool way to start the day. 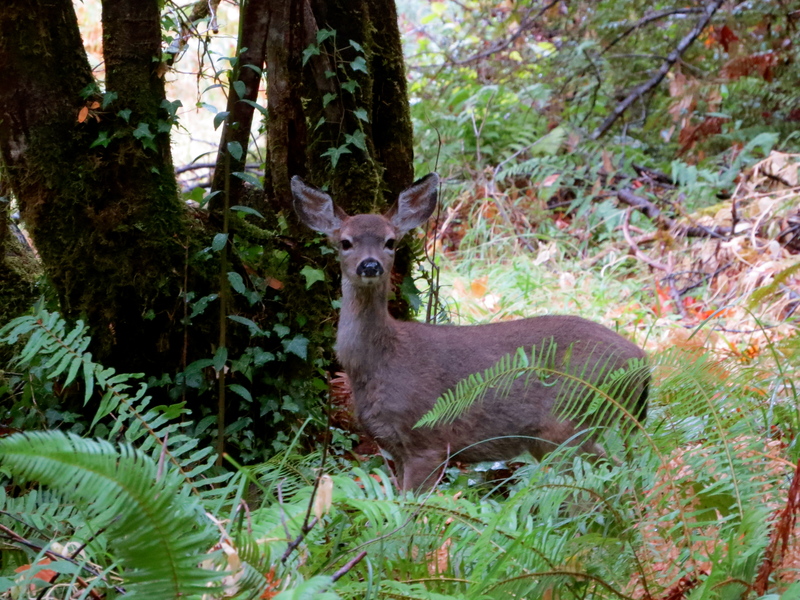 Actually, the day started with a close encounter with a deer when Rick Allen and I hiked the hill behind our camp up to the remnants of the Old Frye cabin and surprised this little deer on the trail. Deer on the trail above Missouri Bar camp. 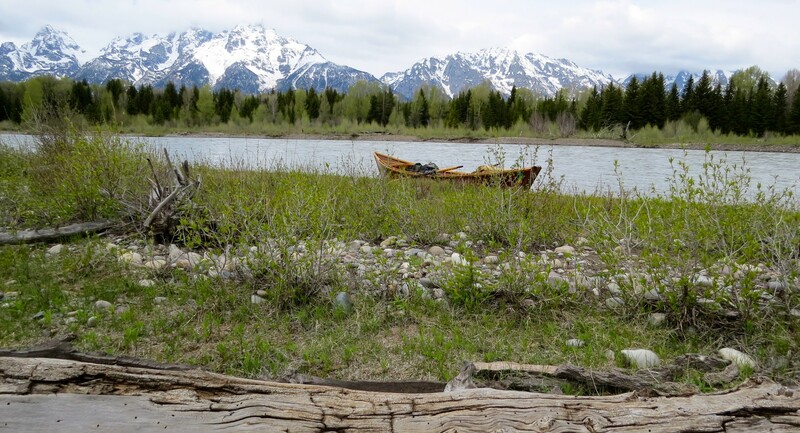 That same day we rowed the difficult Class IV’s – Mule Creek Canyon and Blossom Bar. It’s been my experience that the higher water and rising river makes Mule Creek a little easier and Blossom a little harder. All our boats made it safely through the twists and turns of the canyon and when we rounded the corner for Blossom we discovered that 3 boats from previous trips were “down” in Blossom. One was sunk in the Picket Fence, one was lodged at the top of the Beaver Slide – presenting us with an additional rowing challenge, and a raft, complete with frame, was “shipwrecked” and washed up on shore at the bottom of the rapid. Tan colored Cataraft wedged at the Beaver Slide in Blossom Bar. So much destruction in one rapid made us cautious and careful but we all ran the gauntlet of boulders, eddies, and holes to reach the bottom “floating” – all boats upright… and had a quick shot of whiskey in Celebration Eddy before running Devils Staircase. It’s a term of endearment and it “fit’s”. Scott is also the Commander of the kitchen, Captain feng shui of the campsite, and camp Sergeant-at-arms if we forget to wash our hands before coming into the kitchen or if we set up the dish washing station in anything but the “upriver to downriver” configuration. 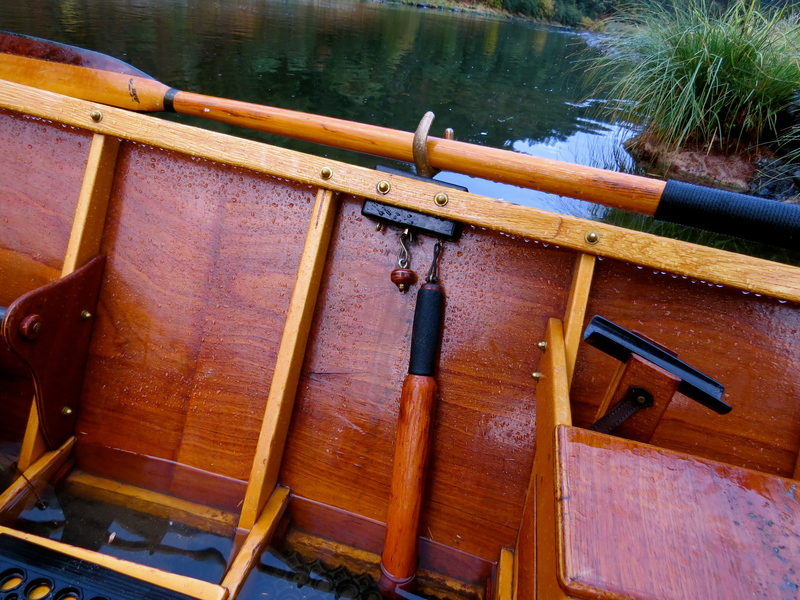 If the “Seinfeld Soup Nazi” was in charge of a river trip that would be Scott… and we love him for it. 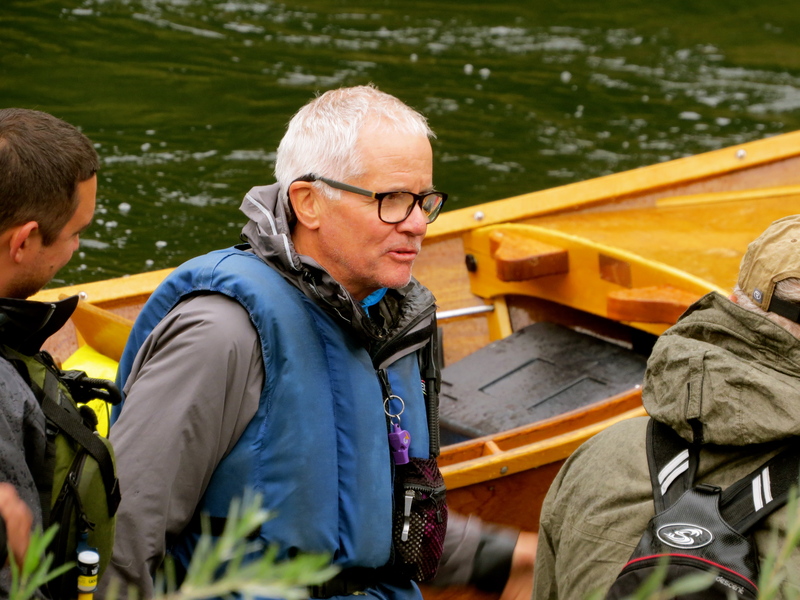 He’s also great on the oars and the camera. 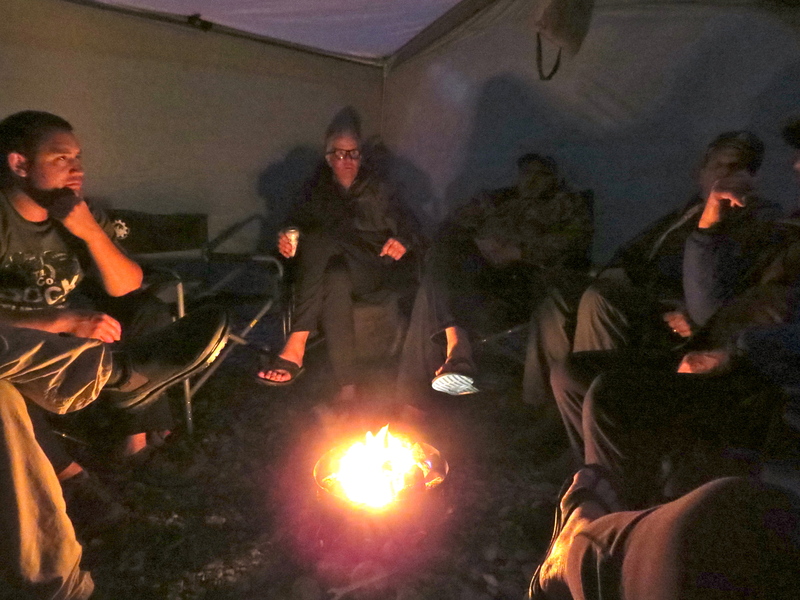 Cot camping on such a rainy trip was challenging but Therm-a-Rest has a great rain-fly that kept me dry and Pendleton has a National Park Blanket that kept me warm so I was more than comfortable on this trip. 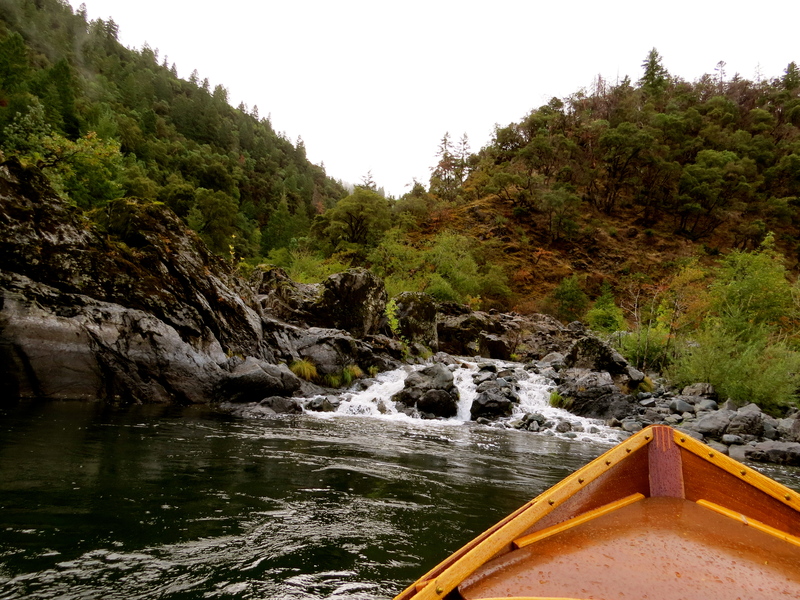 If you ever have the chance to run the wild and scenic section of the Rogue – I would highly recommend it. If wilderness camping is not your thing – there are historic lodges along the way that are rustic and cozy. 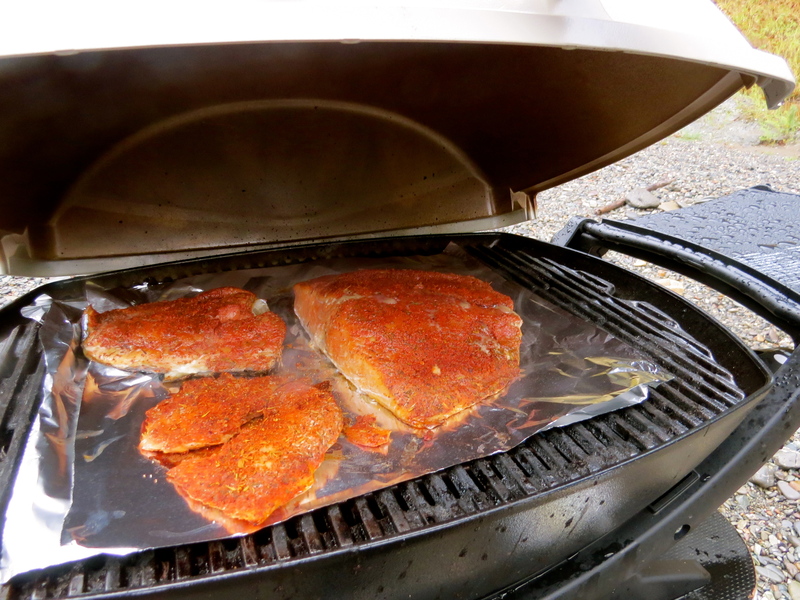 I can feel the rain on my face, taste(almost) the fish in the skillet and feel the WOW in my gut. Rain or shine, is there anyplace better? !